Community quilt #4 was a biggie! Huge, in fact. I had to extend both extension tables for my Sweet Sixteen, and still the quilt fell off the edges of table and dragged a little. This one was a big challenge. There was lots of ‘white space’ and some very pretty stars. Like Community Quilt #3, I had to let this one sit a while before deciding how to quilt it to do it justice. Even so, I still hadn’t decided on all the elements before I started — I made several decisions as I went along. 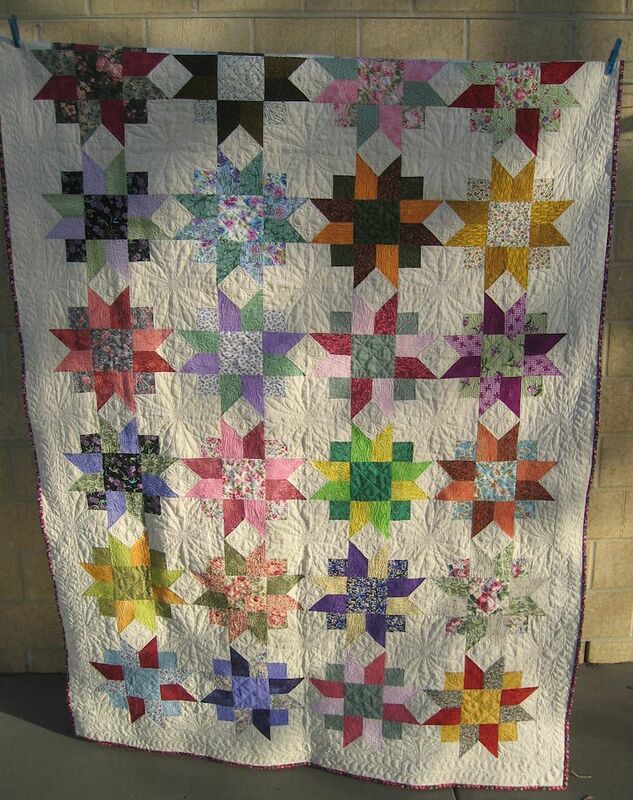 I first decided to quilt the small squares between the stars. 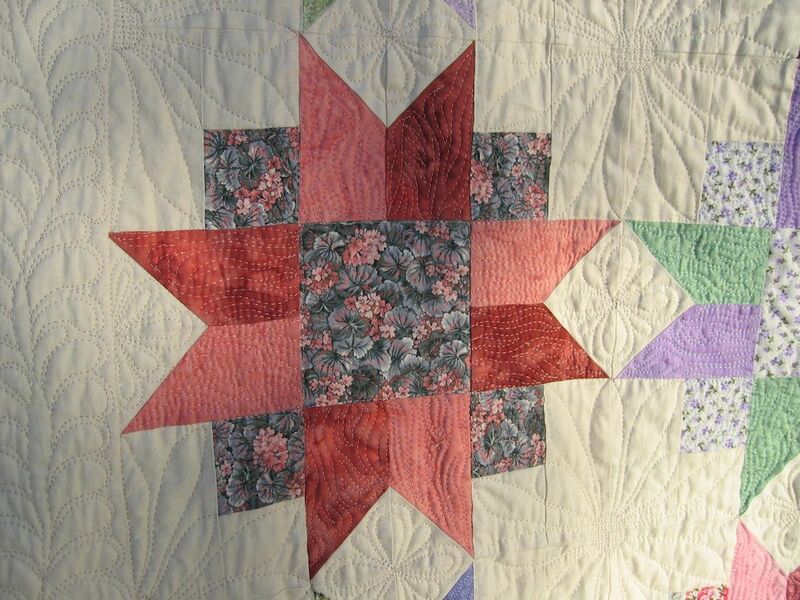 I just did a double flower type of design in a neutral thread that matched the calico used for the ‘white space’. 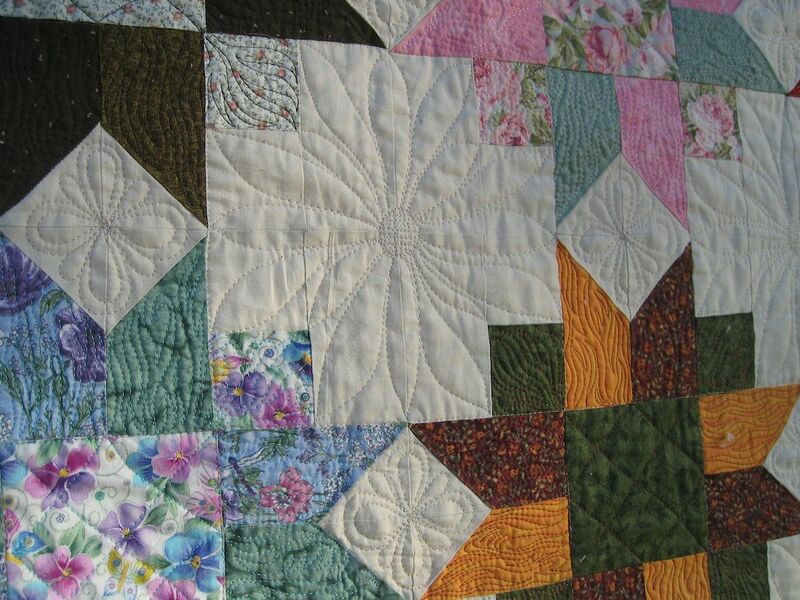 While I was quilting them, I was thinking about how to quilt the large odd shapes of white spaces between the stars. I’d already started with a flower theme for the small squares, so I decided to extend that a bit into some freeform stars in the bigger areas. As there was quite a lumpy bit in the centre where these pieces joined, I made a flower centre by creating a circle, then radiating the petals out from it to the corners where the coloured stars met the white space. After completing the petals, I cross-hatched the centre of the flower, before moving on to the next one. I did half-flowers in the spaces near the border. The next decision was how to quilt the stars. 8-pointed stars with 4 setting squares are an awkward shape to quilt, so I decided to keep it simple and did a flame design in all the star points and setting squares, in a variety of threads that matched each star. 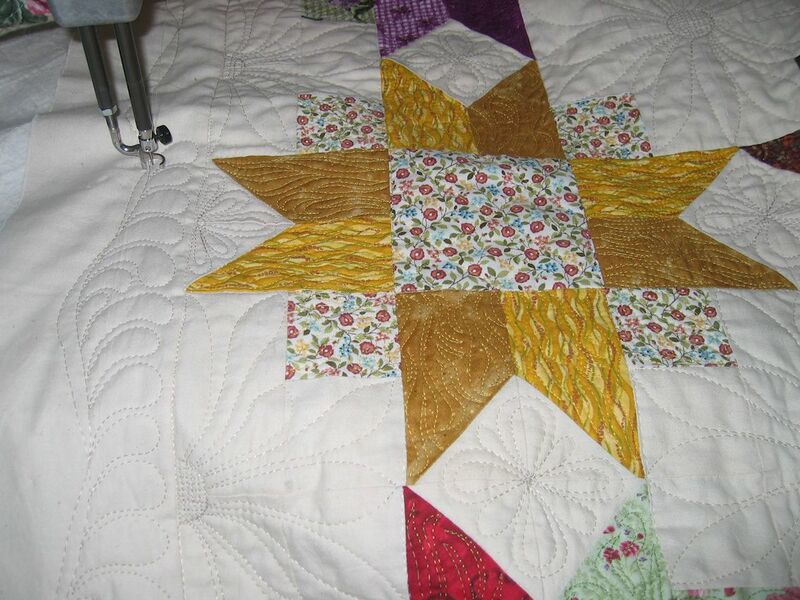 The next decision was what to do with the centre square for each star. Too much quilting might be overkill, so again, I went for something simple and just did a large freeform cross-hatching from corner to corner and between the joins of the star points. The final decision was what to do in the border. Again, I didn’t want the quilting to overpower the pretty stars, so I went back to the neutral thread and decided to do some freeform feathers. First I stitched a wavy spine, then stitched another over it going in the opposite waves to create an irregular spine. Then I stitched my feathers using the Diane Gaudynski method of stitching each shape separately, then echoing the shapes about an eighth of an inch away to create the illusion that the feathers are joined. Only the binding remained, and it was done! BTW, there are more than 200,000 quilting stitches in this quilt! Love your quilt motif choices. The large flowers with the cross-hatch are perfect. I have done several items where the many pieces come together at a center point and have done something similar to prevent it from “poofing”. Diane Gaudynski’s feather technique is awesome. 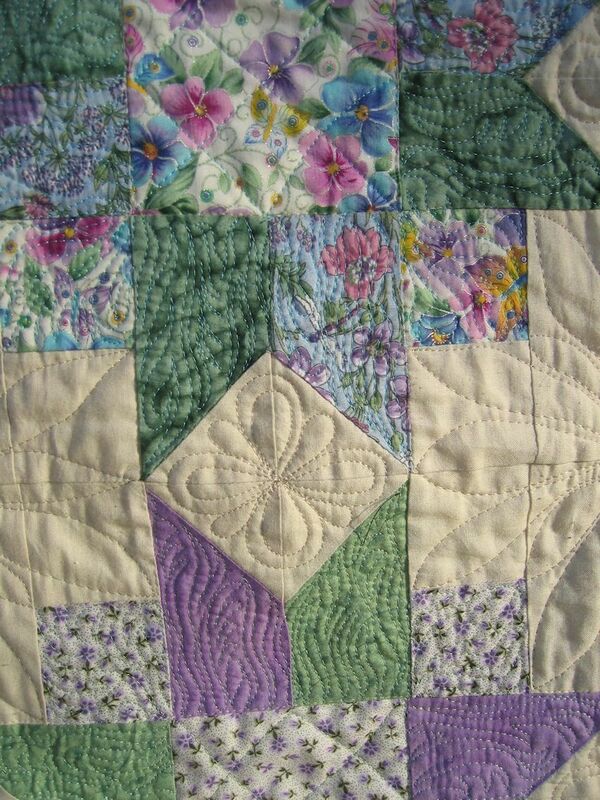 A while back I purchased 2 of her feather quilting books and love them. That quilt is awesome! Still hoping to purchase a Sweet Sixteen later this Fall…….